The best kept building in the town on our 'bluebird' trip yesterday was a beautiful white church. 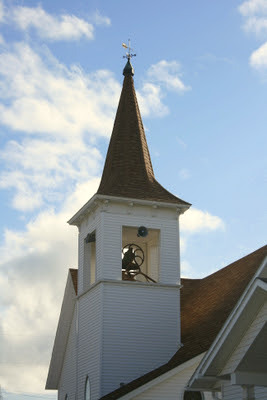 Built in 1903, it is alive with tender loving care and serves the community for 100 miles around. Although it has been nicely kept and updated when needed, the character of the old church remains. It's in pristine condition and it's spire in the center of town speaks to all who pass through. While photographing this pretty white church, two church ladies stopped to deliver some floral arrangements. They were so friendly and answered all my questions. They even invited us inside to give us a tour of the entire facility. Their friendliness was of the type that is frequently too rare in larger communities --- but was genuine and true in theirs. They truly were a blessing to us.